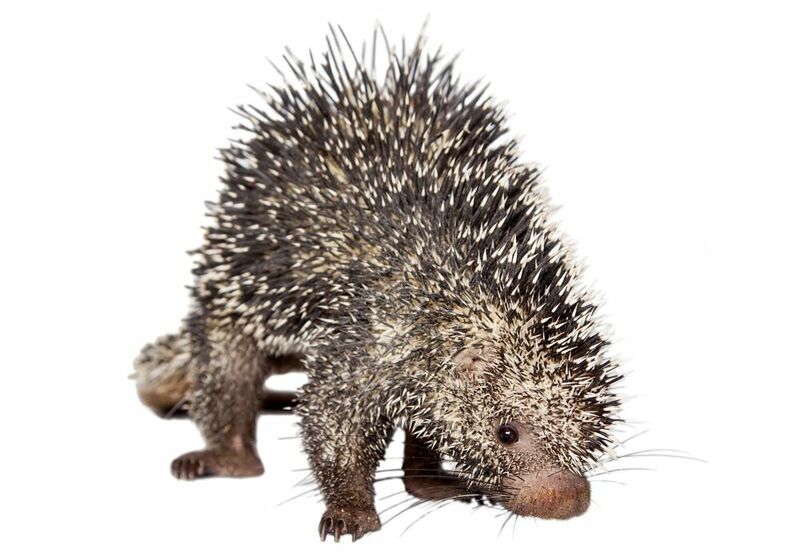 The porcupine is a large, round, slow-moving rodent with a spectacular means of defense. It's muscular body is covered with up to 30,000 long, hollow and pointed quills. The North American porcupine is one of the world's most recognizable animals because of it's body full of prickly spines, that are essentially modified hairs. 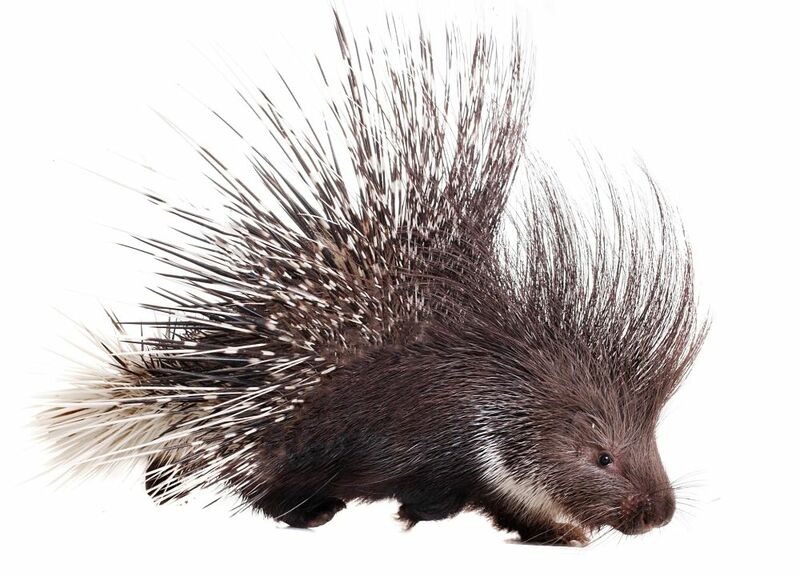 The porcupine cannot throw it's quills, but if a predator makes contact, the spines easily detach and lodge mercilessly in the attackers skin, causing stinging pain when entering, and tearing the flesh upon extraction. Although the quills themselves are not poisonous and can't kill, it is possible that numerous spines lodged in an animals face, eyes, or mouth can render them defenseless, or unable to eat or hunt, and a lingering death may occur. Most predators willingly allow these imposing animals a very wide path, and porcupines can be observed peacefully trundling along quite impervious to virtually anything, as they search for nuts, berries and buds to eat. They are relatively fearless, but if danger approaches the porcupine gives lots of warning of the pain it can unleash. 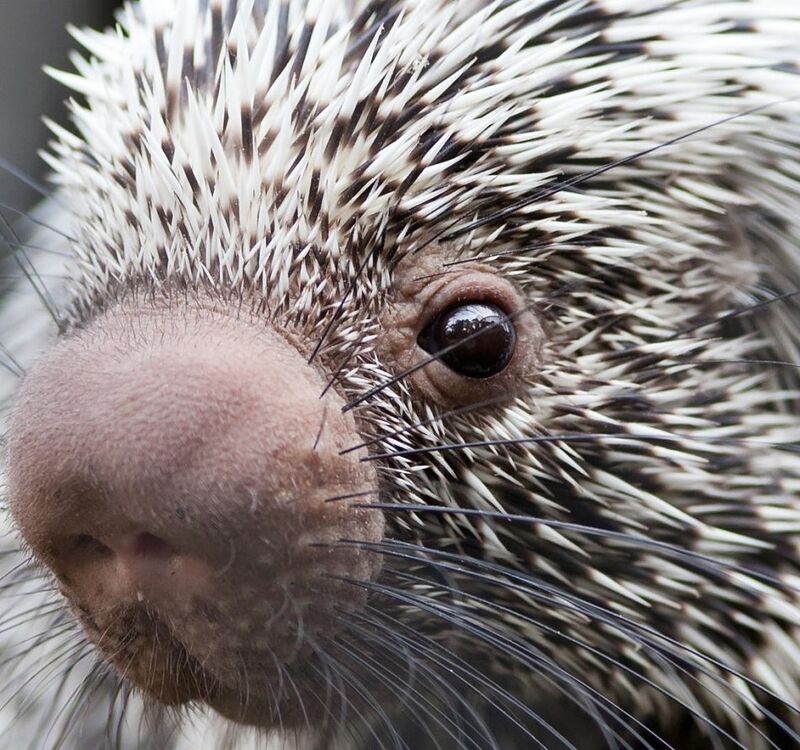 Porcupines have a musky odor that is described as being similar to very rank human body odor. that The musk intensifies if the porcupine is stressed, which should be enough of an alert, but in the event that a dog or bear cub presses the issue, porcupines will chatter their teeth, stamp their feet and rattle their quills together to make a series of intimidating sounds. If the threat gets too close, the porcupine may swing it's rear around and strike the aggressor with it's tail. and when in full attack mode, the porcupine lunges backwards, thrusting dozens of raised quills towards the intended target. The razor sharp quills easily dislodge on contact and have scale-like barbs that pull them a little further into the victims skin with every movement. Only the cougar and the rugged little fisher, which is a type of weasel, regularly kill and eat North American porcupines, and only during lean times. 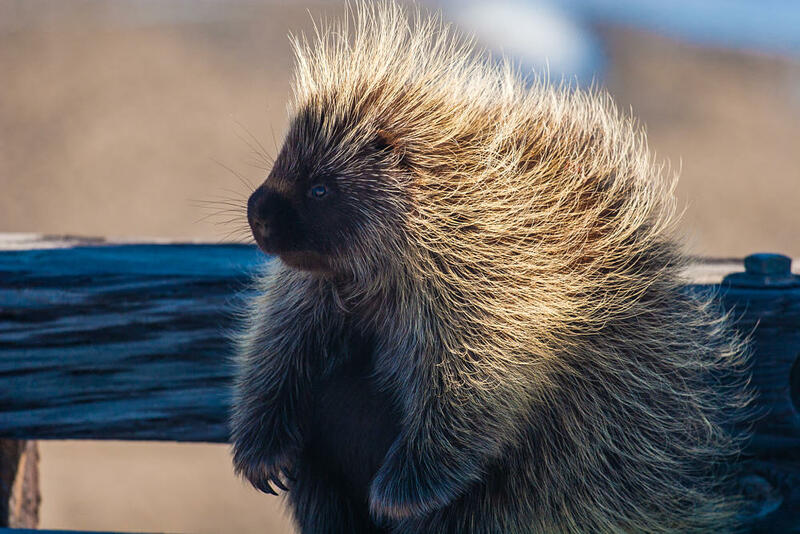 Golden eagles and great horned owls have also been reported hunting them, but in general, porcupines remain unmolested as they go about their business. 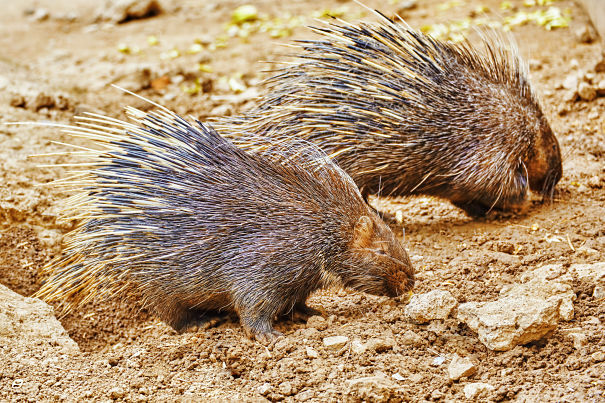 Porcupines are cathemeral, meaning they may be active night or day. They are herbivorous, eating leaves, shoots, buds, fruits and nuts. 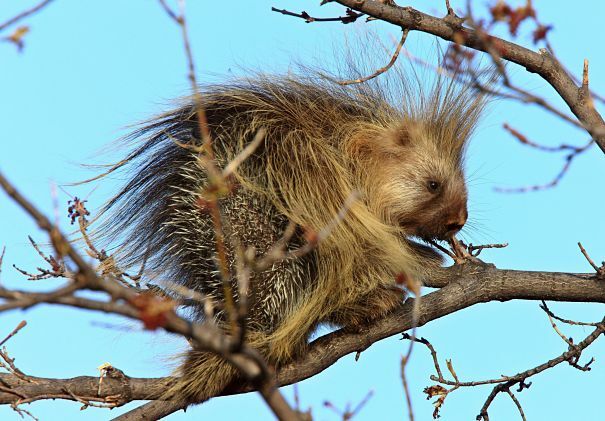 Although they appear awkward, and are husky to say the least, porcupines of North and South America are actually arboreal and forage, eat and sleep in the trees. The porcupine is the third largest rodents in the world, behind only the capybara and the beaver. There are about 2 dozen species of porcupines, and these are broken into the Old World porcupines and the New World porcupines. The Old World porcupines are ground-dwellers, and usually live in pairs or small groups. They include the largest porcupine species, the African Cape porcupine, whose extremely long spines (up to 20 inches), can be raised like a crest to make them appear twice as large. The New World porcupines include the familiar, tree-dwelling North American porcupine, also known as the Canadian, or common porcupine. There are about 7 sub-species of North American porcupine, all varying only slightly in size and coloration. They have very long guard hairs that give them a "fluffy" appearance, with tens of thousands of quills hiding below. Also from the New World are the amazing prehensile-tailed porcupines of Central and South America, which have naked, prehensile tails, bulbous noses and a prehistoric or even alien appearance. Rodents make up about 40% of all the mammal species on Earth. 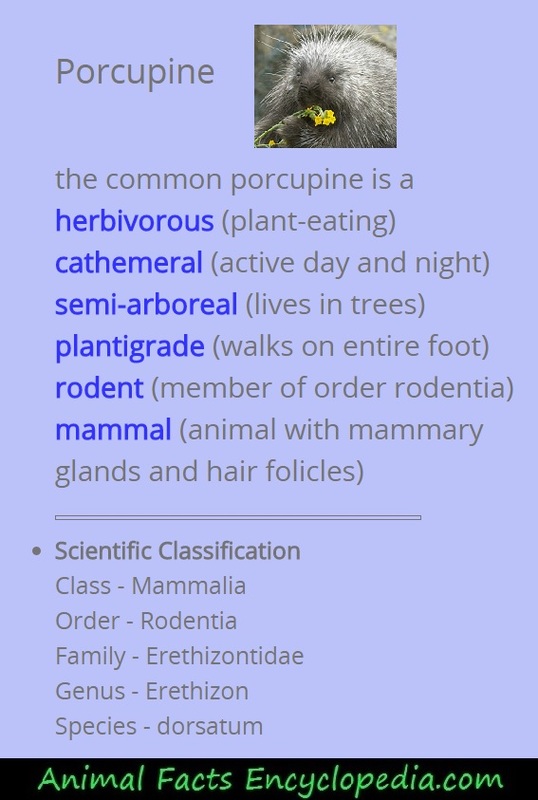 They are an enormous family of creatures, and although the Old World porcupines, and New World porcupines, are all from the same branch of the rodent family, they are actually not closely related. The major difference between Old and New world species is that the Old World porcupines live on the ground and often in small groups, while the New World porcupines are mostly solitary and live in trees. Old world species range throughout Africa, Asia and Europe, and include brush-tailed porcupines that are only about 4 pounds, to the largest porcupine species, the African cape porcupine, which can be almost 3 feet long and 45 to 60 pounds. The Cape porcupines form monogamous pairs and stay together to raise their 2 to 4 youngsters, called porcupettes. 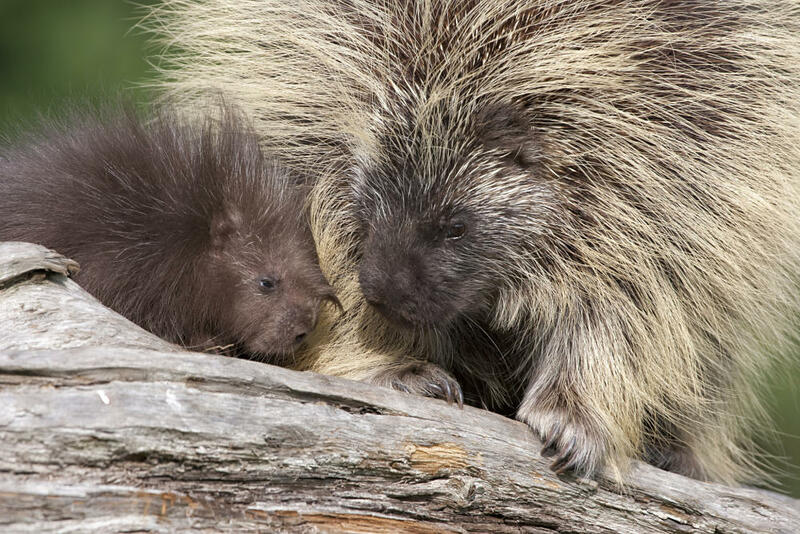 Male Cape porcupines have even been known to raise babies on their own, if the mother passes. The New World porcupines are the North American porcupine, also known as the Canadian or common porcupine, the tree porcupines, and a few other species including the stump-tailed porcupine. 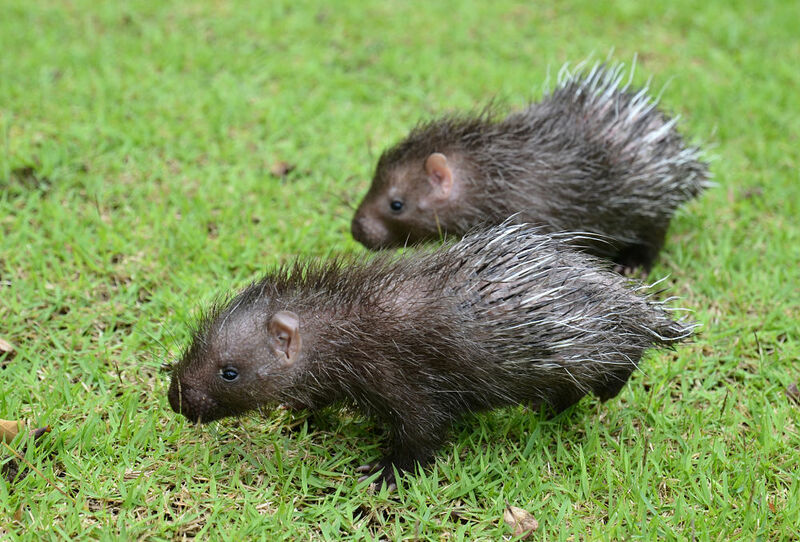 The tree porcupines are found in the rainforests of Central and South America. 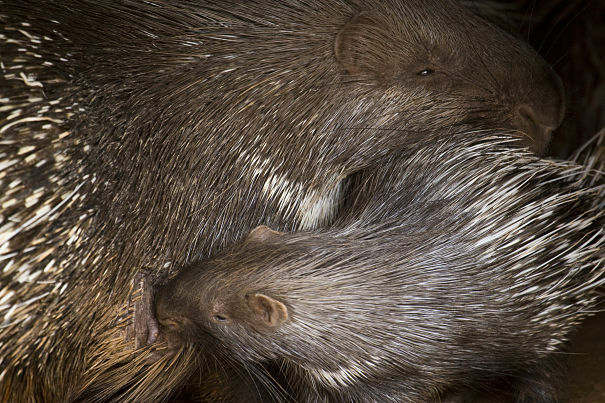 They are covered with dense quills, except for their large noses, bellies and the end half of their tails. The end of the tail is naked, and can grasp limbs and support the animal like a fifth limb. It is not as versatile as a monkeys tail, with which monkeys can actually hold and manipulate items, but is used mostly for support while climbing and reaching for fruits in the trees. 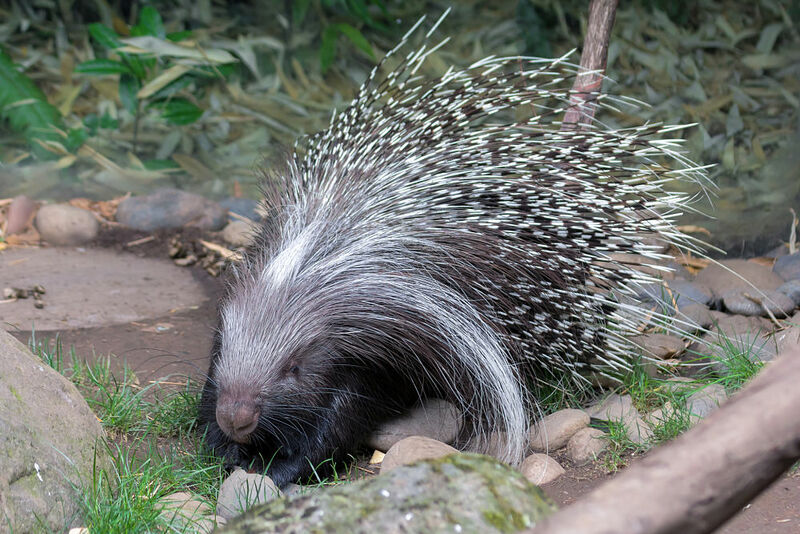 The Brazilian porcupine is a prehensile tailed variety that reaches about 24 inches in body length, with a tail that is about 19 inches long. They can weigh up to 15 pounds and spend their days sleeping in the treetops of the Brazilian rainforest. At night, they cruise through the trees eating fruits, twigs, buds, flowers and nuts. They have strong, curved toes that wrap around branches, and a roughened pad on the bottom of the tail helps with grip. These animals occasionally come down from the trees to eat crops or flowers. On the ground, these specialized feet don't conform well to walking. The going is slow and the porcupine will roll up in a ball if it feels threatened, leaving just a shroud of spines to contend with. 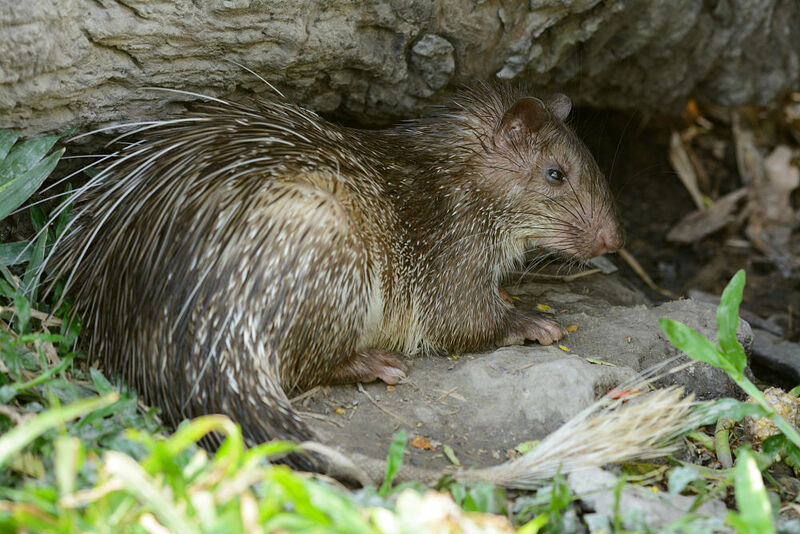 There are also two species of rat-like porcupines, one native to Africa and the other to Asia, called brush-tails. They have short quills over their bodies and a tuft of quills on the tail which they use as a club when threatened. Brush-tailed porcupines are mostly nocturnal and more omnivorous than the other species, eating insects and small lizards as well as vegetation. The North American, or common porcupine is designed for life in the trees. They have curved claws and powerful curved feet to grasp and climb. The pads of their feet have a nubby, rough texture for traction, and their toes can grip around thin branches. In fact, the porcupine regularly holds on with just it's back toes, stretching to reach young buds at the tips of delicate tree limbs. It is this lust for tender greenery that finds porcupines tumbling from the tree tops on a surprisingly regular basis. The impact may shake numerous quills loose, and leave a smattering of spines on the forest floor. They may also impale themselves on themselves during such an event, which is why nature has coated each quill with a penicillin-like grease that prevents infection. Common porcupines live alone, only coming together to mate. They are mostly nocturnal, but do forage during the day upon occasion. They are exclusively herbivorous eating fruits, nuts, buds and flowers. They have ever-growing front molars that are orange in color, and are capable of chewing right through the bark of mature trees. They will de-bark trees during the winter when food is scarce, and can cause some damage to forests this way. In comparison, the largest porcupine species in the world, the African crested porcupine, and the African Cape porcupine which are very similiar sub-species, is a ground-dweller that can reach 60 pounds in size. They eat roots and bulbs, and regularly raid farmers crops. They spend the heat of the day in burrows or under rocky outcrops, and start foraging at dusk. These animals are monogamous, and may actually mate for life. They live in small family groups, and the male plays a large role in the care of offspring. - Amazing! The North American porcupine is generally a solitary animal. The female comes into season once a year, and attracts potential mates with urine marking and shrill calls in the night. Multiple males may be lured to her, and may engage in fairly aggressive battles that include clawing and biting and swinging their tails at eachother. During mating season, areas with large porcupine populations will show the results of such battles in lost quills scattered across the forest floor, and the mating calls of both sexes can be heard for miles. Male porcupines are acustomed to being punctured by rivals, and remove quills from their own skin by grasping it with their teeth and twisting. When the battles are over and one male emerges victorious, he still must wait for the female to get in the mood. He will choose a perch in her tree, on a lower limb than her, where he can intercept any other males, and keep an eye on her. To woo her, he will spray her with a stream of urine loaded with male pheromones. These chemicals usually stimulate the female, and arouse her. She will climb down to the ground, the male following, and when she is ready she will raise her tail over her back. The male must manage the copulation situation very carefully, and mating can only be accomplished with the females complete cooperation. She is only receptive for a short window of 6 to 12 hours, and the pair will mate several times until the male is exhausted and climbs away home. Female porcupines are pregnant for about 7 months. 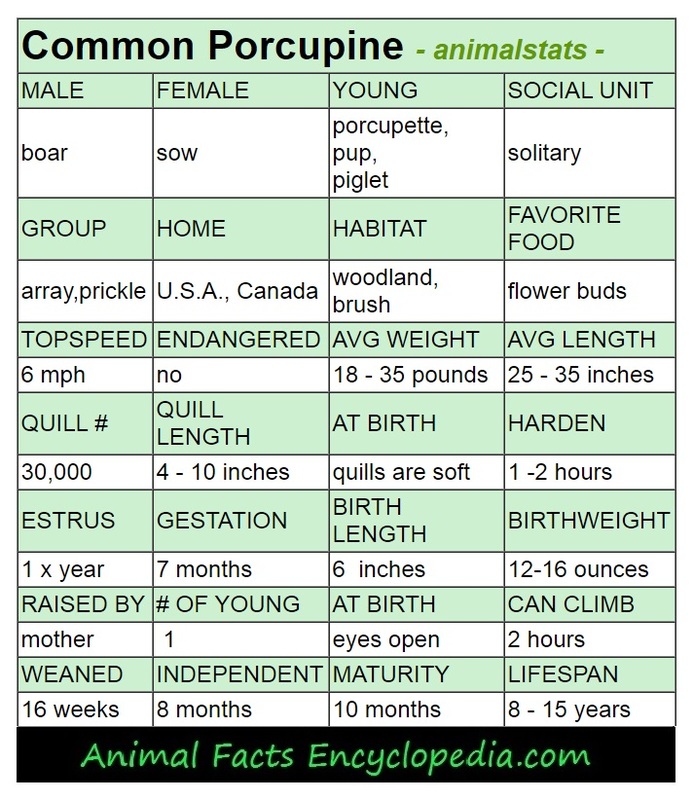 This is a long pregnancy for a rodent - consider that the larger beaver has a gestation period of 124 days - and it is reflected in how developmentally advanced the newborn is. 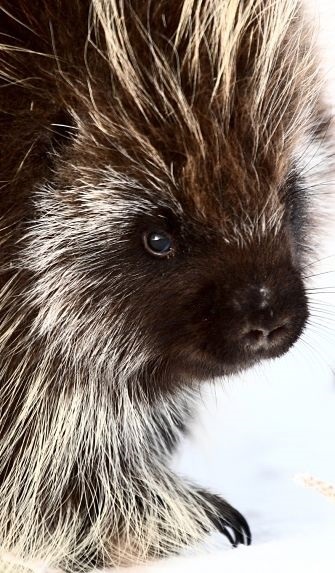 The porcupine baby, called a porcupette, comes into the world with eyes open and a full coat of spines, but the quills are soft and rubbery, and only harden when exposed to the air. After only about an hour of life outside the womb, the baby porcupine is climbing and nursing, and it's quills are hardened weapons. Babies begin to forage for solid food after just two weeks, and are weaned at 3 or 4 months. They stay with mom for about 6 months, with some hanging around for more than a year before heading out on their own. North American porcupines have three types of hair on their bodies, underfur which is short, soft fur of a blackish-grey color, gaurd hairs that can be over 12 inches long and give them that "fluffy" look, and, of course, quills. 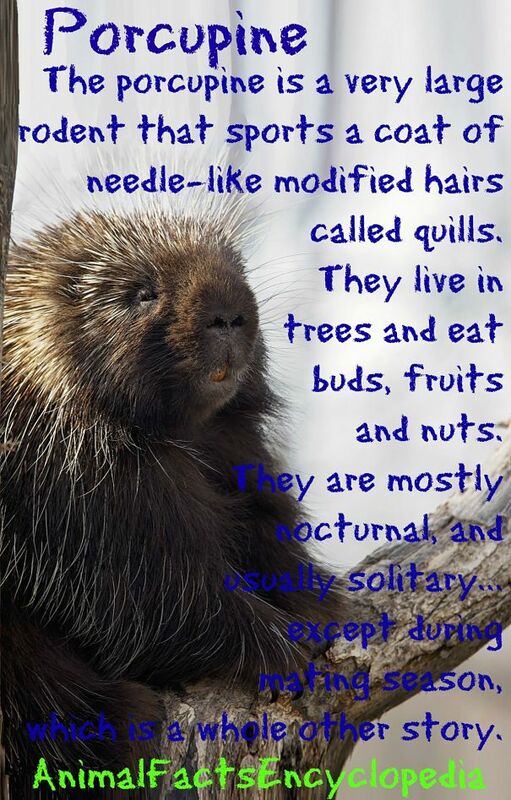 The diameter, length and location of the quills varies from species to species, but all porcupine quills are made from keratin. Keratin is a common substance in the bodies of most mammals and forms hardened, generally nerve-less structures like fingernails, hair and feathers. In fact, the porcupines quills, although often described as enlarged, modified hairs, are actually closer in construction to feathers. The quill is hollow, like the shaft of a feather, and in the case of some African species, can be as wide as drinking straws. They are raised up away from the body by thin muscles under the skin, and operate like venetian blinds, in rows, much as feathers are organized across the body. All the porcupines have some barbing, usually on the tip of the quill, but the brush-tailed porcupine has small saw-tooth barbs lining the sides of each quill, like the tines on a feather. Painful going in, the quills of most porcupines cause even more pain when they are extracted. That's because the tips of each quill have hundreds of microscopic, backward-facing barbs that look much like fish scales. These barbs are flexible and allow the tip of the quill to penetrate deep into the skin, then splay out and bend against the skin when pulled out, anchoring the barb and requiring more force to remove, causing additional tearing as a result. The barbs may cause damage to flesh, and slow, unpleasant deaths of unfortunate victims may result from starvation through the inability to hunt or eat, but infection rarely, if ever, occurs. Why? Because the quills are covered with a thin layer of greasy secretions that actually inhibit the growth of bacteria. So why would an animal that defends itself with such a merciless weapon, provide it's victim with protection from infection? Because sometimes, the victim of the porcupines vicious quills, is the porcupine itself, or, occasionally a family member. Usually it takes a bit of an event for accidental punctures to occur. Something like an aggressive encounter, or more often a fall from a tree. Imagine your a slow moving, rounded, rodent slipping off a tree branch hurtling to the ground, and anywhere you land is a pile of spikes. Well at least you won't get a nasty infection while your waiting to heal. 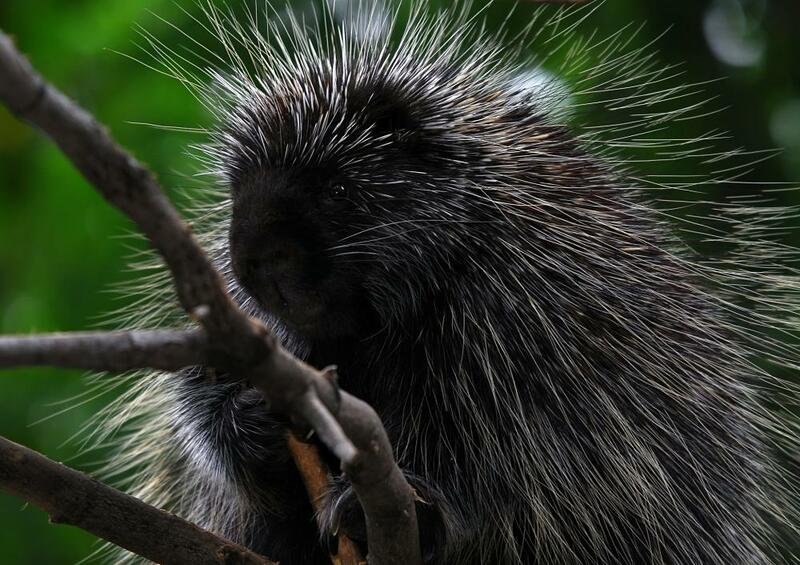 Porcupine guard hairs are used to make a Native American headress called a "roach"